Reservations can be made in advance at boxoffice@villagerstheatre.com or by calling 732-873-2710. Certain coupons must be presented at the box office. RESERVATIONS will be released 30 minutes before showtime. LATECOMERS are seated at the discretion of theater management. NO REFUNDS will be made in any form. Please see our website for our Refund Policy. THE THEORY OF RELATIVITY - This unconventional and moving musical drama examines the interconnectedness of all people through an array of diverse life experiences. 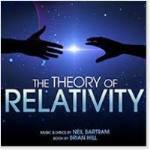 From Drama Desk Award nominees Neil Bartram and Brian Hill (The Story of My Life), The Theory of Relativity is a joyous and moving look about our surprisingly interconnected lives. Whether you're allergic to cats, in love for the first or tenth time, a child of divorce, a germaphobe or simply a unique individual, audience members and actors alike are sure to find themselves in this fresh new musical. SHREK THE MUSICAL - Based on the Oscar-winning DreamWorks Animation film, Shrek The Musical is a Tony Award-winning fairy tale adventure, featuring all new songs from Jeanine Tesori (Thoroughly Modern Millie; Caroline, or Change) and a sidesplitting book by David Lindsay-Abaire. Shrek brings all the beloved characters you know from the film to life on stage and proves there's more to the story than meets the ears. "Once upon a time, there was a little ogre named Shrek...." And thus begins the tale of an unlikely hero who finds himself on a life-changing journey alongside a wisecracking Donkey and a feisty princess who resists her rescue. Throw in a short-tempered bad guy, a cookie with an attitude and over a dozen other fairy tale misfits, and you've got the kind of mess that calls for a real hero. Luckily, there's one on hand... and his name is Shrek. Shrek presents a treasure trove of creative opportunities, including costumes, sets, puppets (there is a fire-breathing dragon after all) and more! Irreverently fun for the whole family, Shrek proves that beauty is truly in the eye of the ogre. Senior Arts Festival - Performers who are 55 and over singing, dancing, reciting poetry, and having a grand time showcasing their talents so all can see and understand that age is just a number! PIPPIN (2013 Broadway revival version) - There's magic to do when a prince learns the true meaning of glory, love and war in Stephen Schwartz's iconic and unforgettable musical masterpiece.